In her interview, Irina Fedorovych, coordinator of the project ‘Reaching equality – participatory approach to enhancement of equality and non-discrimination in Ukraine’ highlights what the frequently used word discrimination means in practice and how can discrimination be countered in everyday life. 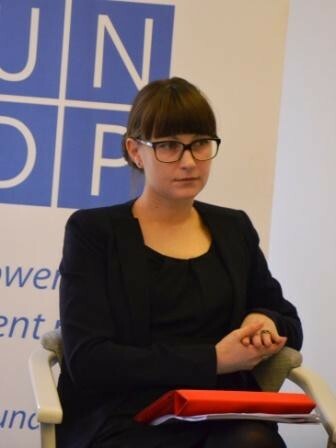 “In Ukraine there is no positive quota, which allows to some extent limit the rights of the majority for the implementation of minority rights”, – says Irina Fedorovych, coordinator of the project ‘Reaching equality – participatory approach to enhancement of equality and non-discrimination in Ukraine’. In her interview, she highlights what the frequently used word discrimination means in practice and how can discrimination be countered in everyday life. – The word discrimination is widely used nowadays. What does it mean for Ukrainians? Could we consider discrimination, for example, the fact that in Verkhovna Rada women are underrepresented in comparison with men? In general, discrimination means limiting of rights that is based exclusively on inalienable characteristics of a person. Respectively, a term vulnerable groups refers to women, older persons, handicapped, Romas. This might include different forms of discrimination. For instance, violation of Roma’s rights in Ukraine is obvious: it refers first of all to refusal to give them passports, their low access to education and health services. However when a young woman with high-level competences cannot find a job only because she has a little child or can potentially get pregnant, this is discrimination as well. As for the gender factor in Verkhovna Rada, underrepresentation of women in Ukrainian authorities regularly attracts attention of European organizations, in particular, UNO and Council of Europe. Mechanism of positive quotas that allows to limit majority rights to a certain degree on behalf of realization of minority rights is absent in Ukraine. This mechanism has its advantages and shortcomings, but its application for a limited time could influence the situation in a positive way. – Does Ukrainian government pay any attention to the problems of discrimination? What steps does it take to solve them? In Ukraine there are a lot of problems in the field of human rights, as long as during 20 years those questions were not sufficiently addressed. The term discrimination was not used in Ukraine’s legal framework, except of being mentioned in the Constitution. Country lived without a single specialized law that should have defined discrimination, forbid it, and fixed the punishment. This law was elaborated and adopted for the first time only in 2012 under the pressure of European Union in the framework of realization of Visa liberalization action plan. Certain forms of discrimination, such as towards handicapped people or gender-based discrimination, were foreseen by a specialized laws. However, it was basically impossibly to speak about discrimination in general because of the absence of its legal definition. Therefore, till recently the problem was not acknowledged and, consequently, no work for its solution was conducted. – Comparing Ukrainian and EU experience in preventing discrimination what principal differences can you name? Among other legal instruments of the EU, there are Directives that require the EU member states to achieve a particular result without defining the concrete means. Four specific Directives that forbid discrimination establish a minimal standard and, in this way, create common legal framework for all EU member states. During certain time, those directives were implemented into the national legislations. Those directives have no relation to Ukraine so far and could only serve as a sample. European Charter of Human Rights forbids discrimination as well, while the highest authority in the EU member states is European Court of Justice. The EU citizens can apply to it in case they are not satisfied with the decision of the national court. After the fact of discrimination was acknowledged, one can expect that the guilty will be punished. As it is foreseen by the Ukrainian law of 2012, one can achieve just determination of discrimination, but it is practically impossible to bring the guilty to justice. Punishment is possible exclusively in certain cases, which are regulated by specialized laws. Art. 161 of the Criminal Code of Ukraine is de-jure enabling to resist discrimination, which foreseen production in court only after the investigation in police. However, duration and low efficiency of this procedure makes this option an exclusively declarative: over the last year no one addressed police on being discriminated. Therefore, acknowledgement of discrimination in this situation is the biggest achievement. – Which requirements concerning countering discrimination does the EU put on Ukraine in view of its European integration? Adoption of a complex antidiscrimination law is one of the points of the Visa Liberalisation Action Plan. Its fulfilment was one of the requirements of the first stage of realization of the Plan, but it was achieved only partially. Progress of Ukraine in this regard was reflected in a summarizing report of the European Commission in November 2013. Besides the unclear definition of discrimination (both direct and indirect), this law does not foresee responsibility. Amendments to this law should allow citizens to apply directly to this law in case of discrimination and bring the guilty to justice through the legal proceedings. – From which sources could citizens get information about discrimination in Ukraine? As a result of the long absence of legal definition, there was no systematized data or state statistics in this field. Thematic researches on derogation from rights of certain vulnerable group were conducted by civil society. Only after adoption of the specialized law on discrimination, it was fixed that Office of the Ombudsman was an institution responsible for countering the discrimination. Theoretically, this authority is also responsible for collecting the respective data. However, Ombudsman is dealing only with direct individual claims and his/her information is therefore limited to them. Idea of our project was launched in order to create a single coordination platform and in order to unite efforts of NGOs that are dealing with these problems. In 2011, on the basis of civil initiative, a Coalition for counteracting discrimination was created and is constantly developing. At the beginning it consisted of 5-6 organizations, now more than 50 NGOs of different specializations are taking part in it. – Alongside with civil society and local authorities, your project is as well targeting mass media. Do you expect journalists to explain Ukrainians what discrimination is? Analysis of the situation shows that Ukrainian media, firstly, are poorly informed on the discrimination problem and human rights abuse, secondly, do not pay enough attention to this topic, and, thirdly, are often transmitting discriminative statements. Role of media lies in informing the citizens about their rights and options of their asserting. In Ukraine, we observe that people often do not claim on discrimination only because they do not know that their rights were in fact abused. If they are more actively informed about their rights, sooner or later they will begin addressing complaint on their abusing. In this regard, media plays extraordinary significant role, which should not be ignored. The project ‘Reaching equality – participatory approach to enhancing equality and non-discrimination in Ukraine’ aims at raising awareness of public, government and media of the problems of discrimination in Ukraine and to promote the effective mechanisms of counteracting this phenomenon. Duration of the project: 1 January 2014 – 31 December 2015. Budget : 100,660 USD.